There are "significant difficulties" with preventing British-born terror suspects from re-entering the country, the reviewer of terror laws has said. David Anderson QC said there were "legal difficulties" with the proposals announced by David Cameron on Monday. He said there were also "practical problems", saying the UK could end up in a "game of pass the parcel" with other countries' suspected terrorists. The PM also announced plans to strengthen powers to monitor suspects. The government wants to stop Britons travelling to Iraq and Syria to fight and bar - even if only temporarily - those who do from returning home. Mr Cameron said on Monday that UK nationals suspected of being involved in terror acts would be allowed to keep their British citizenship, but would be prevented from re-entering the UK for a period of time. Mr Anderson, the Independent Reviewer of Terrorism Legislation, told BBC Radio 4's Today programme: "I was very struck yesterday by how tentatively the idea was advanced, and I can understand why - I think there are legal difficulties with it. "The whole concept of citizenship is about the right of abode - the right to come back to where you live. If you're going to suspend that - even on a temporary basis - I think you run into some legal difficulties. "But it seems to me there are also practical problems that would have to be addressed on this. "Where is the power to be exercised? Is it when the person is in Turkey, say on his way back from Syria? Is there some way of stopping him from coming back? And if so, where does the person go? Do they go back to Syria for a bit more jihad? Do they go and find a beach somewhere in Turkey? "And, of course, if we start doing this then presumably we must accept the consequences that other people might do it as well. "The trouble with this game of pass the parcel - whether it comes to terrorists or other criminals - is that if other people's terrorists or criminals find their way to Great Britain, they too could say 'Well we wash our hands of these people, we're not going to let them back - they're your problem'." Mr Cameron also announced plans to give police statutory powers to confiscate suspected terrorists' passports at UK borders. Media captionDavid Cameron: "Passports are not an automatic right"
Mr Anderson said there were "quite a few questions" about this plan, including how long it could be done for, what the system of authorisation would be, and what level of suspicion would be required. "I can see the merit of it in principle but when you give these very strong powers to very numbers of people - in this case the police - I think you have to be very, very careful about safeguards," he said. Under the prime minister's plans Terrorism Prevention and Investigation Measures (Tpims) will also be extended to include the power to relocate suspects in the UK. Tpims replaced more restrictive control orders in 2011. Control orders gave ministers the power to place a suspect under close supervision and force them to relocate. Currently Tpims - used in cases where officials decide a suspect can neither be charged nor deported - restrict movement, the use of computers and mobile phones, and meetings with others. Mr Anderson said he backed strengthened Tpims, including suspects being relocated. When control orders were in place and people were being relocated, people "were less able to associate with the co-conspirators, he said. "You wouldn't impose these measures on everybody but there will be very dangerous people subject to Tpims in respect of whom I'm afraid this is a good idea," he added. Former terror suspect Cerie Bullivant has warned against a return to a system similar to control orders, which he said were designed to "debilitate your life". Mr Bullivant was placed under a control order in 2006-07 and said such measures were harmful and ineffective. "It left me with severe depression and it pushed me into a corner where I felt my only option was to abscond and go on the run," he told the BBC's Newsnight, adding that he handed himself in after five weeks. He said evading the authorities was "relatively easy" and claimed none of the people who had absconded while under control orders or Tpims had ever been caught. Dangerous people must be charged in courts and put in prison, he added. Mr Bullivant also criticised the government's plans to bring back powers to relocate suspected terrorists. "While the Conservative government are telling Muslims that they need to embrace British values, they themselves are abandoning them with this internal exile," he said. He called Mr Cameron's announcement "grandstanding, the rehashing of old policies, put out as new, so that the government can be seen to be tough on terrorism when in actual fact all it's going to do is create more of a ghettoisation and disenfranchisement within the Muslim community". But Lord Carlile, former independent reviewer of terrorism legislation, said on Newsnight that Mr Bullivant's comments were "misleading". He said relocation orders worked "very well" and were "fair and proportionate". Speaking about the possibility of stopping Britons returning to the UK from war zones, he said it was "unlawful under international law" to remove the passport of someone who had no other nationality - though it "may well be lawful" to take their passport once inside the UK. As a result he said there was no way to stop British fighters returning, so the only options were to arrest them if there was enough evidence for a prosecution, or subject them to a "beefed up" Tpim if not. Mr Cameron has said 500 British nationals are estimated to have travelled to Iraq and Syria to fight on behalf of Islamic State and other militant groups. The proposed measures announced by Mr Cameron also included forcing airlines to hand over information about passengers travelling to and from conflict zones, and requiring terrorists to undergo de-radicalisation programmes. 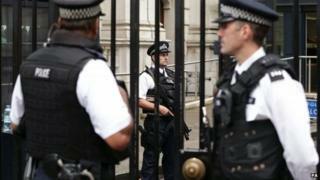 It comes after the UK's terror threat level was raised to "severe" from "substantial" on Friday. Former security minister Baroness Neville-Jones said the government's plans would have a "deterrent effect". She said giving police powers to take people's passports at border points was a "really key and apt thing to do". Speaking on BBC Radio 5 live, she also said interviewing people returning to the UK from war zones would act as a deterrent because people would know "their card will have been marked".